More than 25,000 runners participated in the 2016 Super Heroes Half Marathon Weekend. 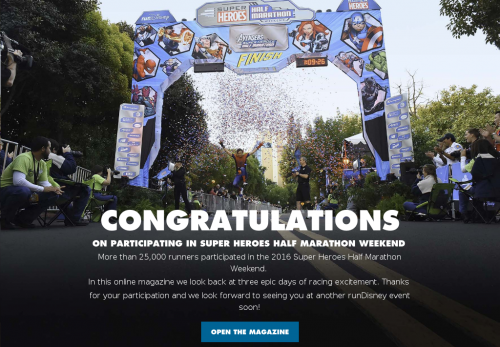 for your participation and we look forward to seeing you at another runDisney event soon! on particpating in Super Heroes Half Marathon Weekend. More than 25,000 runners participated in the 2016 Super Heroes Half Marathon Weekend. In this online magazine we look back at three epic days of racing excitement. Thanks for your participation and we look forward to seeing you at another runDisney event soon!